Hello, fellow crossbow hunter, and welcome to my take on Excalibur’s crossbow scopes. Excalibur was founded in 1983 to make the most efficient, reliable, and accurate hunting crossbow that money could buy. Acquired by Bowtech in 2014, Excalibur continues its tradition of producing excellent products for crossbow hunters and enthusiasts. In addition to x-bows themselves, Excalibur also maintains a catalog of accessories for the weapons, including scopes. This article will let you know the best optics Excalibur offers, along with what to expect from the glass. 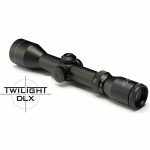 What’s The Best Inexpensive Excalibur Scope? If you are working with a tight budget, but still want a quality x-bow scope, the Excalibur Vari-Zone is an excellent choice. It offers a multiplex reticle and a speed dial that allows you to precisely set up the glass for ranges of up to 50 yards in 10-yard increments, assuming your x-bow shoots between 250 and 350 FPS. This particular model offers magnification from 2X to 4X with a 32mm objective lens. There are only two drawbacks to this glass: the reticle isn’t illuminated, and the windage and elevation adjustments are made in 1/2 MOA increments instead of 1/4 MOA. What Is The Best Excalibur Scope Money Can Buy? Perhaps my favorite x-bow scope out of all the choices on the market is this one, from Excalibur: the Twilight DLX. It offers the best transmittance I’ve ever seen in crossbow optics, providing stunning clarity and image crispness no matter what magnification level I choose or the range to my target. The Twilight DLX utilizes a 44mm objective lens, offering zoom levels from 3X to 6X. Its drawbacks? The scope is only adjustable to x-bows with a velocity of 300 to 400 FPS, and it is rather heavy at almost a pound and a half. Does Excalibur Manufacture Red Dot Sights? Yes, if you prefer a red dot sight, Excalibur has one for you. The company’s Multi Red-Dot Sight uses reflex technology to create a compact, lightweight electronic sighting system. 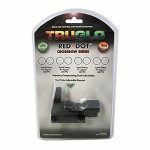 It provides four sighting dots to compensate for arrow trajectory from 20 to 50 yards, and provides a dual red or green color lighting system to allow you to match the color of the sighting dots to best match your eyesight and the background. The real drawback to this sight is that it will only adjust to crossbows shooting from 300 to 400 FPS. I couldn’t find out with any certainty who manufactures Excalibur’s glass, but I know this much: the attention to detail and quality closely parallels those same characteristics common to the company’s x-bows. If Excalibur is farming out production of its scopes, the job definitely isn’t going to the lowest bidder. Even with prices that are highly competitive, the build quality is still quite good. What Are Some Common Features Of Excalibur Scopes? The most common characteristic of this company’s glass is the attention to quality. All of the scopes are built with fully multicoated optics, nitrogen-purged optics chambers, and O-ring seals around the lenses. They’re waterproof, fogproof, and shockproof. In short, these scopes are built to rival some of the most expensive competitors, and they also carry lifetime warranties. How Good Are The Optics In Excalibur Glass? As previously noted, the optics are made of excellent quality. Excalibur utilizes BaK–4 prisms in all of its scopes, along with high-quality glass for the lenses and fully multicoated surfaces. The sight pictures are crystal clear, sharp, with plenty of contrast and excellent color reproduction. I’ve never had a problem with any of Excalibur’s scopes showing fuzziness at high levels of magnification. All of Excalibur’s scopes feature multiplex reticles. They each provide the archer with aiming points in 10-yard increments from 20 to 50 yards, allowing for precise shooting at the most common crossbow hunting ranges. Designed to be parallax-free at 30 yards, these accessories are almost perfectly designed for harvesting deer or other game with a x-bow. Are Excalibur’s Scopes Compact And Lightweight? Most of these products are compact, lightweight accessories that won’t add much weight or girth to your x-bow. With the exception of the Twilight DLX, I’ve rarely had a problem fitting my crossbow with the scope mounted into a standard case. Even the Twilight DLX will fit with a tight squeeze into a crossbow case, it’s just heavier than average. Total magnification on Excalibur’s optics are always variable, and fit within the common zoom levels most useful to crossbow shooters. Most of them offer magnification of 4X, with the Twilight DLX also providing 6X zoom. The sight picture’s crispness, clarity, and contrast remains pristine throughout the entire range of magnification for each scope, providing the user with an image that is almost HD quality. Will I Be Able To Use Excalibur’s Optics In Low-Light Conditions? Thanks to generously-sized objective lenses and fully multicoated optics for excellent transmittance, the glass products are all useful even in low-light conditions. Even better, most of the products feature illuminated reticles with brightness settings that are perfectly matched to virtually any lighting situation. I wish I could provide exact fields of view for Excalibur’s scopes, but the company doesn’t provide those specifications (and I’ve thus far been too lazy to try measuring them myself). With that said, I’ve estimated the linear field of view for each glass to be quite generous, typically in the 50-foot range at 100 yards with full magnification. How Simple Are Excalibur’s Scopes To Mount And Sight In? Particularly easy to set up, the only drawback to getting started with an Excalibur scope is that it won’t come with rings. This is largely due to x-bows not having standardized scope mounting points: some have Weaver-style mounts while others feature Picatinny rails. Be sure to take note of whether the scope you’re purchasing has a 30mm or 1-inch maintube, and order a set of rings particular to your glass and crossbow. Yes indeed, Excalibur’s glass is exceptionally durable. All of the company’s optical accessories are able to take a licking and keep on ticking, so you really can’t go wrong. Thanks for checking out my summary of Excalibur’s x-bow scopes and sights. These products are among the best in the industry, both in terms of the quality of the glass and the price point.